Magic PCO (Photo-catalytic Oxidation) is a novel odor and VOC eliminating technology and can effectively decompose odors and toxic gases to water and carbon dioxide. It reacts as a catalyst in the reaction so its performance is long lasting. Magic PCO can greatly decompose formaldehyde, benzene, toluene, xylene, ammonia, TVOC and other pollutants, and has high-efficiency and broad-spectrum disinfection performance. It can decompose toxins releasing from bacteria or fungi and do harmless treatment. 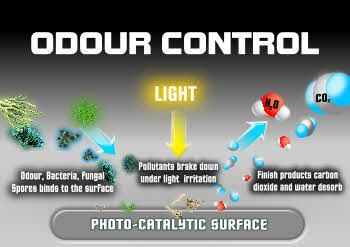 As the PCO (Photo-catalytic Oxidation) technology is effective in neutralising odors and VOC's, it can be widely used in daily life as well as industrial processing to eliminate all kind of odors and volatile organic compounds (VOC's) significantly improving indoor air quality (IAQ). NanoMagic offers a variety of PCO nano coat products, which can be applied in different environments and places. Multi-purpose Functional Nano Coating. Self-sanitizing Green Photo-catalysis Oxidation Power Our ..